Hundreds of years ago Cocos Island was a hideout for pirates (and some say the inspiration for Robert Louis Stevenson’s, Treasure Island). Stories tell of buccaneers burying treasures here… Edward Davis in 1685, Benito Bonito in 1820, and William Thompson in 1821, but if they did leave treasure (there is an authentic treasure map, but no one has ever found any) they also left a damaging legacy – pigs and goats. Seafarers left the animals to breed so that they could hunt them for fresh meat on return trips. They also inadvertently introduced rats, as humans do almost everywhere they go (they haven’t found rats on the moon yet). Now, as in Hawaii, these three mammals are the scourge of the island and the biggest threat to many of the native species. Cocos Island National Park might be thought of as the little Galapagos of Costa Rica. It is the tip of an ancient volcanic mountain isolated by the surrounding Pacific. It has been colonized over millennia and is covered with dense rainforest, but many of the species found here evolved after their arrival, changing into distinct forms that are found nowhere else in the world. These species are referred to as endemics. The Cocos Cuckoo, Flycatcher, and Finch, are endemic bird species, and the Finch has a famous cousin- the Darwin’s finches of the Galapagos Islands, several hundred kilometers to the south. Other Cocos Island’s endemics include 2 lizards, freshwater fish, and nearly a hundred insects. Coco’s Island National Park is isolated in the open ocean. The nearest land is Costa Rica 300 miles (500 km) to the east. The Galápagos Islands are the nearest neighbor a few hundred miles further southwest. (5º32’N-86º59’W) 330 miles (523 km) southwest of Cabo Blanco in the eastern Pacific Ocean. 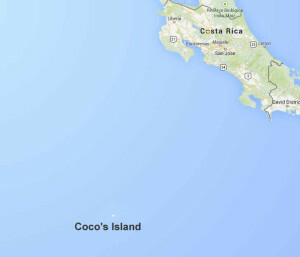 Cocos Island is about 30 hours from the mainland by boat. Charters and Diving tours are the only practical options for visitors. It rains throughout the year. Two drier seasons occur from January through March and to a lesser extent in late September and October. Weather – Average annual temperature 75 °F (24 °C), and more than 240 inches (6,000 mm) of rainfall per year. Established – It was this unique ecological diversity that led to the executive decree in 1978 creating Cocos Island National Park. Unfortunately it takes more than a decree to protect an ecosystem. One of the biggest problems on Cocos Island is the loss of native species to species introduced by man (pigs, goats and rats). Inhabitants – The endemic species of plants, fish, lizards and birds (the Cocos Cuckoo, Flycatcher, and Finch) generate the most interest. Offshore, the two most famous inhabitants are whale and hammerhead sharks.